Sometimes the pursuit to create clever, unique, or "original" ideas for characters can distract us from the real job of creating characters that feel honest, true, and engaging. A great way to find that honesty is to look in your own life at the characters you already know! This series of quest cards offer quick and tiny thinking strategies that, when completed, will have set you up with the beginnings of a cast of characters. Not all quests are epic! This quest is intended to take 5 minutes to take the challenge and 5-10 minutes to post about it if you care to share your experience, process, or results! 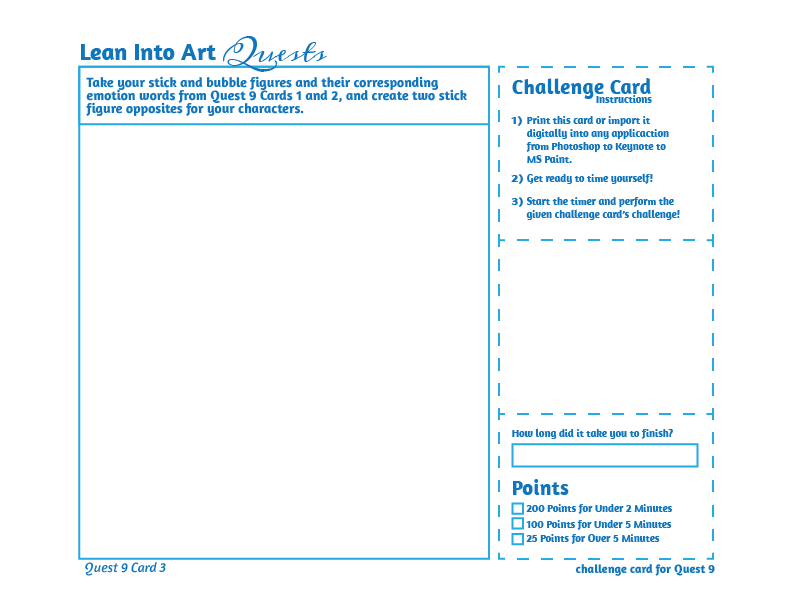 Choose a Quest Card and take the 5 minute challenge! Choose a Quest Card and take the 2 minute challenge! Share your results in a blog post and Twitter with the #liaquest9 tag. Unlike Quest 8, these cards are meant to be done in order. Tweet your quest card results to unlock more, be sure to include the hashtag #liaquest9!